Due to the secretive nature of okapis and the thick forest habitat they inhabit, it is difficult to reach an exact number of individuals. Currently there are estimated to be round 25,000 individuals in the wild. 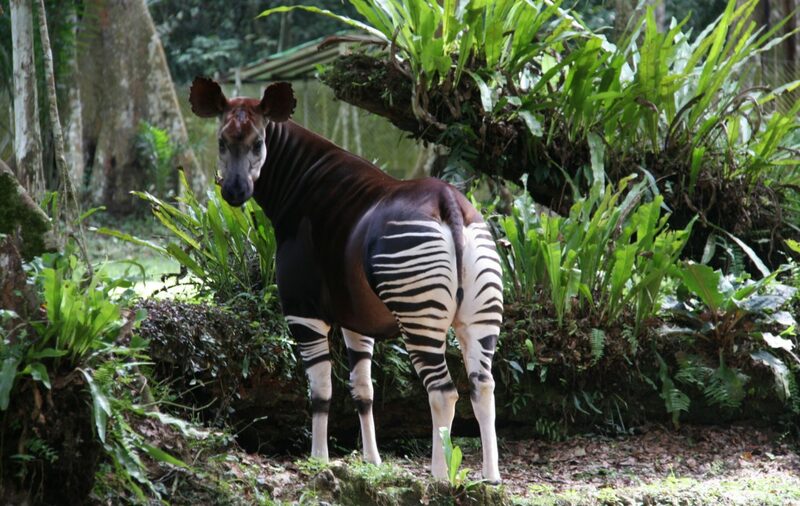 Okapi are endemic to the tropical forests of Democratic Republic of Congo. Distribution extends across parts of central, northern and eastern DRC. They are found in dense, high canopy forests between 450m and 1,500m above sea level. They are herbivores, feeding on leaves and buds, grasses, ferns, fruits and fungi. They have an exceptionally long tongue which they use to selectively browse for suitable plants. The main threat is habitat loss due to logging and human settlement. Extensive hunting for bushmeat and skin has also led to decline. The presence of illegal armed groups in and around key protected areas is a current threat as they prevent conservation action and facilitate poaching, logging and illegal mining. The okapi is a protected species under Congolese law. The Okapi Wildlife Reserve and Maiko National Park support significant populations and strengthening the protection of these two protected areas is the most important means to ensure the long-term survival of the species. Tusk supports the Okapi Conservation Project which works to protect the natural habitat of the okapi and the remaining population living in the Okapi Wildlife Reserve.